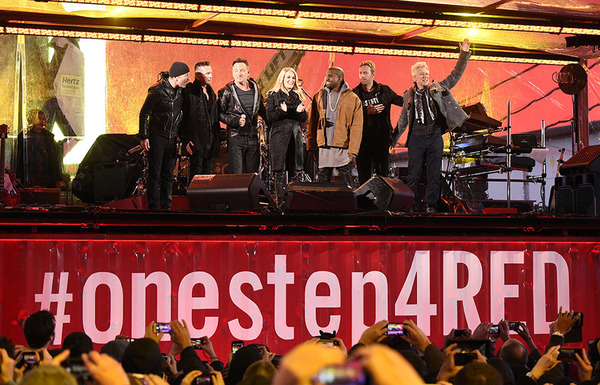 Welcomed to the stage in New York's Times Square by former President Bill Clinton, U2 Minus 1 hosted some pretty special guests for World AIDS Day - Chris Martin of Coldplay, Carrie Underwood, Kanye West and Bruce Springsteen. As reported earlier, Bono, recuperating from his recent accident, couldn't be with the band for the (RED) Thank You presented by Bank of America ... but some pretty special friends had agreed to step in. Wearing a t-shirt with the slogan 'SUBSTITU2', Chris was right at home singing with U2 Minus 1. 'I want to send this one out To Bono in Ireland,' he said, 'Be well my friend'. Were you in Times Square for the show? Or did you catch it online? Add your reviews in the comments below. As cool as the Boss and Chris Martin are... only BONO is meant to sing U2 songs! B´Man, YOU are the ONLY ONE!! No one else can sing like you…YOU ARE U2…with Larry, Adam and The Edge. Come back and get well well soon. The world miss you!!! Great that Chris Martin and Springsteen stepped in true pro's, but there is only one front man and voice that can sing the songs like they were meant to be sung, just didn't feel right with no Bono out front. The songs didn't ignite like only Bono and the boys can make them. Get well soon Bono you are missed. Well done all. We missed you Bono. #GetWellSoon We had a great time in NY with everyone, and for a great cause! Bono, I think you are irreplaceable...get well! I was in the crowd for this very special day. All of the performers did an incredible job but above all else it really made me appreciate the talent and charisma of Bono. Get well soon! Chris look thrilled to play with you guys but you all looked pretty excited to play with the Boss. Great cause, great idea to have the fill ins for U2-1. Hope you feeling better Bono. One great night... U2´s songs were amazing played by others singers... but Bono is the man for U2. Hugs from Brazil! !